Be Prepared To Be Awesome! Troop 200 is Beaufort's Low Country Scout Troop. Chartered by the St. Peter's Catholic Church, Troop 200 has served the Beaufort Community with an exciting scouting program that emphasizes outdoor adventure, teamwork, and leadership. With approximately 15 scouts ages 11 to 18 years old, Troop 200 offers an active fun-filled year-round program. Troop 200 welcomes boys from all backgrounds and faiths. Our Pack 200 continues to offer great scouts wanting to move on to Boy Scouts. Contact our scoutmaster for information about the pack. 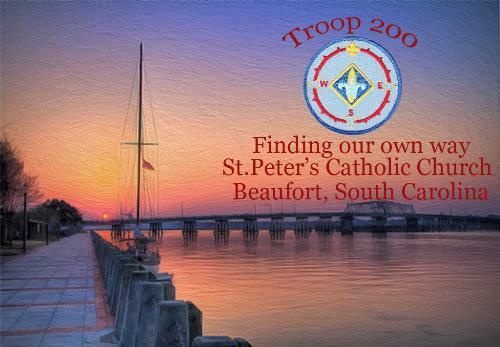 Troop 200 meets every Monday night at 6:00 at St. Peter's Catholic Church, in the Saint Claire room, 170 Lady's Island Drive, Beaufort, SC 29907. Please come visit us!